The IUPAP-IUCr project 'Utilisation of Light Source and Crystallographic Sciences to Facilitate the Enhancement of Knowledge and Improve the Economic and Social Conditions in Targeted Regions of the World' has been approved and funded under the 2016-2019 ICSU Grants Programme. The ICSU Grants Programme is a competitive, peer-reviewed programme that supports innovative collaborative scientific initiatives of relevance to science and society. The programme seeks to facilitate active collaboration between Scientific Unions and other members of the ICSU community (for example ICSU Regional Offices, Interdisciplinary Bodies, Joint Initiatives, Networks, etc.) by addressing long-standing priorities for ICSU members in developing science education, outreach and public engagement activities, and to mobilise resources for international scientific collaboration (www.icsu.org/what-we-do/projects-activities/icsu-grants-programme/?icsudocid=grants-2016-2019). The IUPAP-IUCr proposal, prepared by Sekazi Mtingwa and Sandro Scandolo for IUPAP and Michele Zema for the IUCr, and supported by as many as 25 institutions (including UNESCO, ICSU-ROA, ICSU-ROLAC, ICTP, TWAS, IUMRS and several large-scale facilities), received maximum grades in all of its aspects: relevance to the thematic topics, innovation, scientific quality, cost effectiveness and proposed participants. The idea for a Caribbean Light Source was discussed at a roundtable discussion at a workshop in Cuba in 2016. Through this project, now known as LAAMP (Lightsources for Africa, the Americas and Middle East Project; http://www.iucr.org/outreach/laamp), ICSU will partner with IUPAP and IUCr to enhance Advanced Light Source (AdLS) and crystallographic science in Africa, the Middle East, Mexico and Caribbean. AdLSs have revolutionized research in many science and technology disciplines, leading to a proliferation of facilities worldwide (the website lightsources.org has links to some 47 facilities in 23 countries in various stages of operation, construction or planning). However, although the SESAME AdLS in Allan, Jordan, has recently circulated its first beam and hopes to begin experiments in the next few months, no AdLS facility operates in Africa, Mexico or the Caribbean. 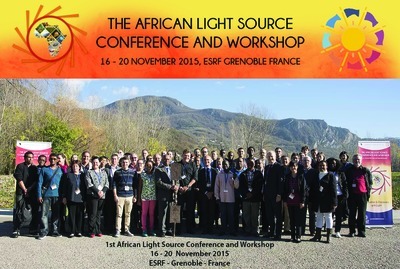 The first African Light Source Conference and Workshop was held at the ESRF in Grenoble, France on 16-20 November 2015. This is where the partnership between IUPAP and the IUCr for LAAMP actually started. To start the process of growing and enhancing AdLS and crystallographic science in those regions, LAAMP will undertake the following tasks: (1) develop a Strategic Plan for each region to grow and enhance its AdLS and crystallography user communities; (2) establish a Colloquium Programme for each region to recruit new AdLS and crystallography users; (3) publish an Information Brochure that describes AdLSs, crystallography and the many fields that they impact; (4) facilitate researchers' visits to AdLS and crystallography facilities; and (5) convene a meeting at UNESCO to present the regions' Strategic Plans and define the charge for more detailed Business Plans that include feasibility studies of constructing AdLSs in regions where they do not yet exist. By enhancing AdLS and crystallographic sciences, the regions' peoples will benefit from research that will tackle devastating viruses such as Zika, Ebola and HIV; the development of sustainable sources of clean energy; and investigations into archaeological and paleontological treasures. Thus, a major outcome of this project will be acceptance by governments that AdLSs and crystallography will bring major advances in their countries' socio-economic development. LAAMP is inviting applications from Faculty-Student Teams to spend two months at participating AdLSs during the 2017-2019 triennium. The faculty should be employed at a university in Africa, the Caribbean, Mexico or the Middle East and accompanied by his/her PhD student. LAAMP will provide 2000 Euros per person to cover transportation. Any excess will be applied to accommodation/subsistence. The remainder of accommodation/subsistence should be negotiated with the host AdLS and other sources of support. After the visit, the team should provide a description of the research conducted, including any resultant publications, and an evaluation of the non-scientific aspects of the visit, including positive experiences as well as ways that the visit could be enhanced in the future. The first call closed in April 2017 and those teams will start their training soon. The second call is expected to open before the end of 2017; please visit www.iucr.org/outreach/laamp regularly for more information.